My First Hands-On Encounter With The Cartier Tank à Guichets: A Dream Come True! I hardly dare to say the name out loud. This is the Tank I have always dreamed of handling, but something I have never been able to do in all the years that I have been following “La Maison” to any possible event. 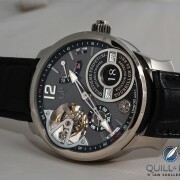 Don’t get me wrong: the Tank à Guichets was never my grail watch. That honor belongs to the Tortue XL in platinum. No, the Tank à Guichets, which dates back to 1928, was always somewhat holy for me. It was one of those watches that I thought I would never be able to handle up close due to the fact that there are so very few in existence. I have seen a few, of course, but always behind glass at exhibitions like “The Power Of Style” in Prague, “Time Art” in Zürich, and at the most recent exposition in London, “Cartier in Motion,” which mainly exhibited vintage Cartier watches and clocks. Cartier has some beautiful examples of the Tank à Guichets in its private collection. Looking at this watch behind glass and having it in your hands are two completely different things, though, and when the opportunity presented itself to photograph an example, my enthusiasm kicked into overdrive. So what’s so special about the Cartier Tank à Guichets? Over the years Cartier has made many watches that are very special or really exclusive, such as the Tank Cintrée and the Tortue Minute Repeater. But the Tank à Guichets is the only watch that is so very different from any other watch in Cartier’s collection, past and present – and that over a full 90 years. Appearing in 1928, the Tank à Guichets was Cartier’s first jumping hour wristwatch. You can call it a mechanical digital watch – or even a mini Zeitwerk if you like, just 80 years earlier. Whatever you call it, Cartier was ahead of its time; this rare Tank wrote history and was for many years Duke Ellington’s watch of choice. Aside from the original of 1928, there was a smaller Tank à Guichets produced in 1996 with its crown at 12 o’clock in a limited edition of just three pieces in 18-karat yellow gold and three in platinum. The platinum Tank à Guichets I feature in this article was launched in 1997 to commemorate Cartier’s 150th anniversary. It was 2005 when the last 100 Tank à Guichets models ever made arrived in the boutiques. That version was in pink gold with a large crown at the 3 o’clock position. Like all models of the 150th anniversary collection, this platinum Tank à Guichets sports a ruby cabochon in the crown, which is slightly smaller than the crown on the pink gold model launched in 2005. Aside from the case metal in which the watch is crafted, the only difference between the two models can be found in their slightly different-sized crowns. Both have otherwise the same dimensions and share the same manual wind 9752MC caliber produced by Piaget for Cartier. The Tank à Guichets is in every sense a true Tank; the major difference between this watch and all other Tank watches is the “closed” dial side in which there are just two apertures: one for the slowly moving minutes and one for the jumping hours, which make one fast jump forward at the top of every hour. The case and dial look a bit like one piece of solid metal. Yes, the Tank à Guichets will turn 90 years old in 2018, but I doubt if that will be a reason for Cartier to launch another version. The watch industry has faced tough times over the last few years, which makes the creation of commercially successful watches a necessity more than ever before. So I am afraid we may not see another Tank à Guichets any time soon. This is such a niche watch for specialist collectors so it is only ever produced in small limited editions – making it hard to produce within a reasonable price range. But with Cartier we never know what will happen: “La Maison” surprises us time and again. Hi can I purchase this wonderful watch from you?